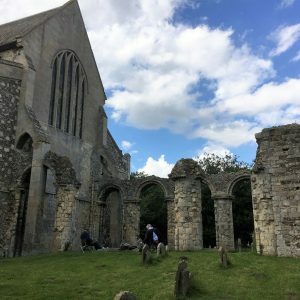 Until the mid 12th century the Normans had not built any royal castles in Suffolk. 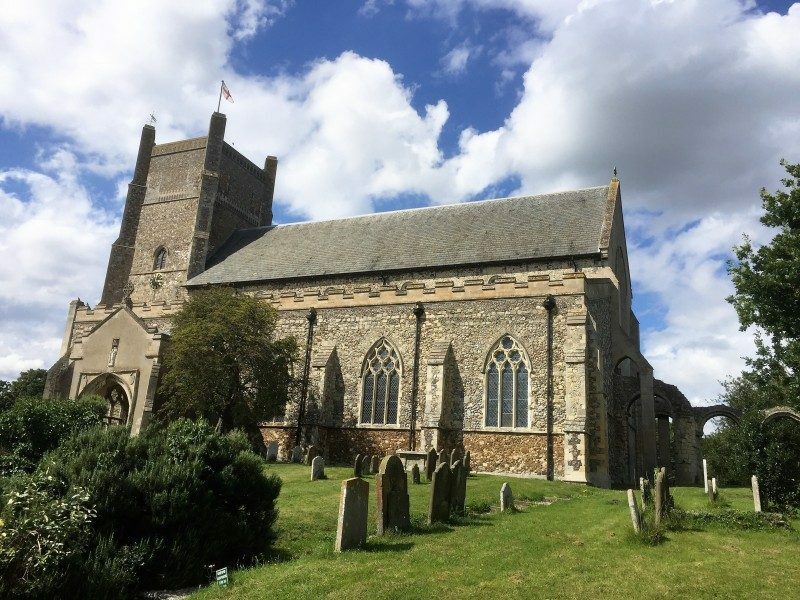 King Henry II sought to remedy this, thereby increasing his power in the area, and between 1165 and 1173, he built a castle at Orford, which at the time was a busy port, and rivalled Ipswich as an important trading centre. 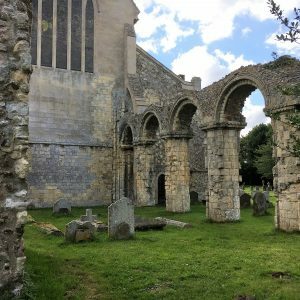 The original Norman church at Orford was built at the same time, c1166. 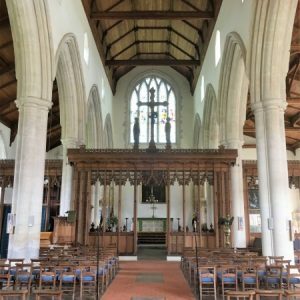 The church was a cruciform building with nave, central tower, north and south transepts and chancel. 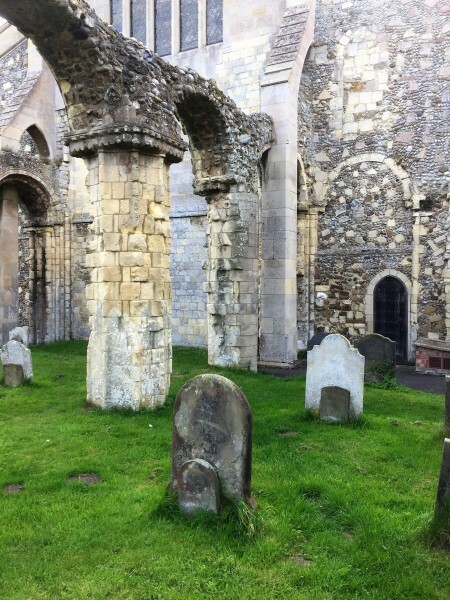 The ruins of the chancel arcades are all that remain of this early building. 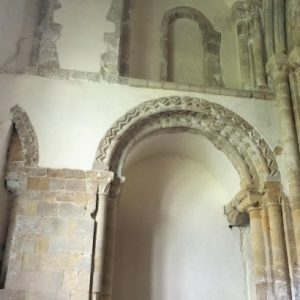 The photographs in the gallery below show the ruins of the Norman chancel. 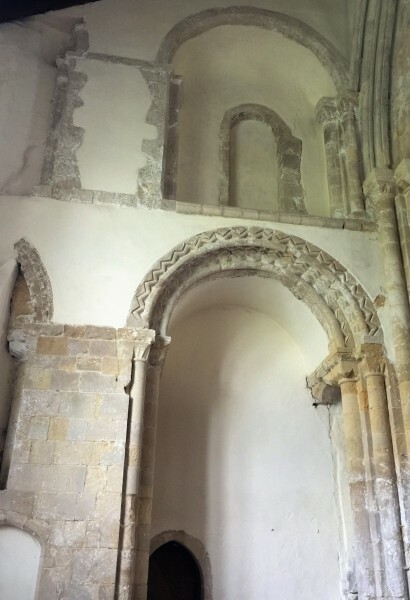 First is a view of part of the north arcade, and the blocked arch and doorway leading to the north transept. 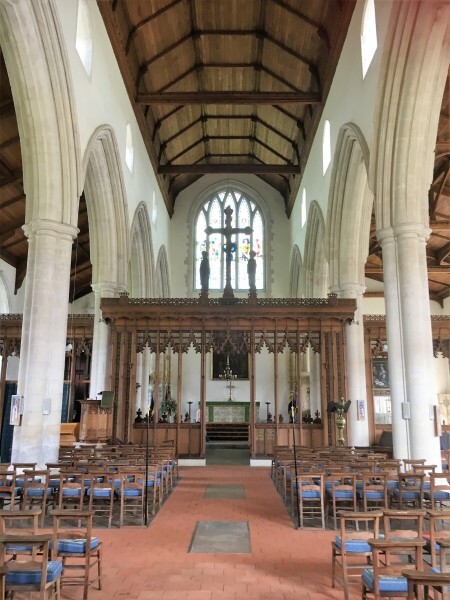 Next is another view of the north arcade which retains the typical Norman carved column capitals and semi-circular arches with their zig-zag moulding. 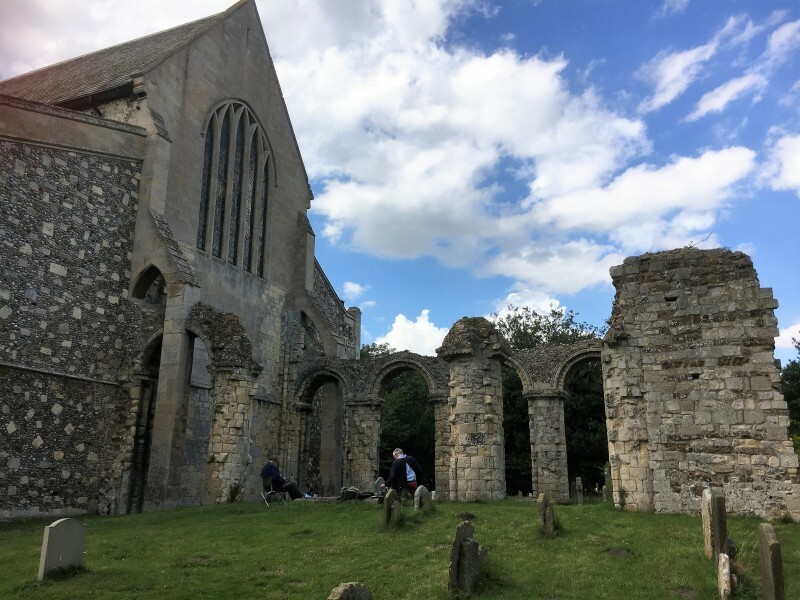 The third photograph includes the south arcade ruins showing only two extant Norman columns, and to the far right, a section of the east wall of the old chancel dating to the 15th century. 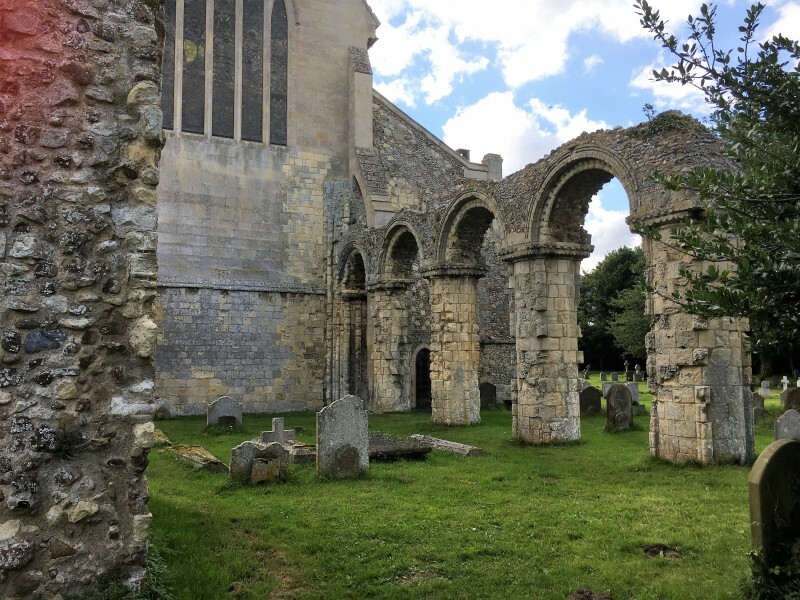 In the early 14th century, c1320-30, a new nave with north and south aisles, and a west tower were built. 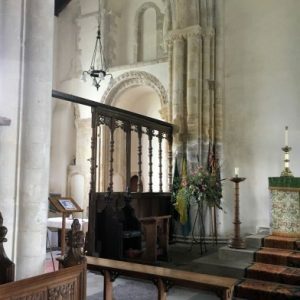 At this time the Norman chancel was still in use, the complete building being some 180 feet long, including the tower. 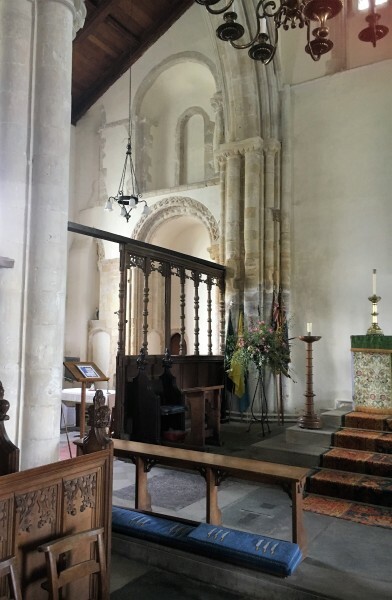 A south porch was added in the 15th century. 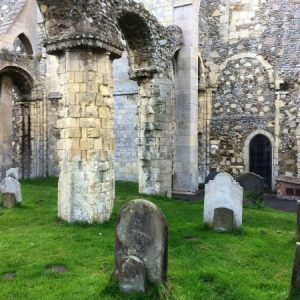 Around the turn of the 16th century (into the 17th), the east end of the nave was walled up, closing off the old chancel. 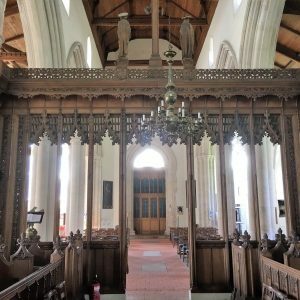 The second gallery starts with a photograph along the nave with its finely carved, early 20th century rood screen and rood group of Christ on the Cross, the Virgin Mary, and St John. 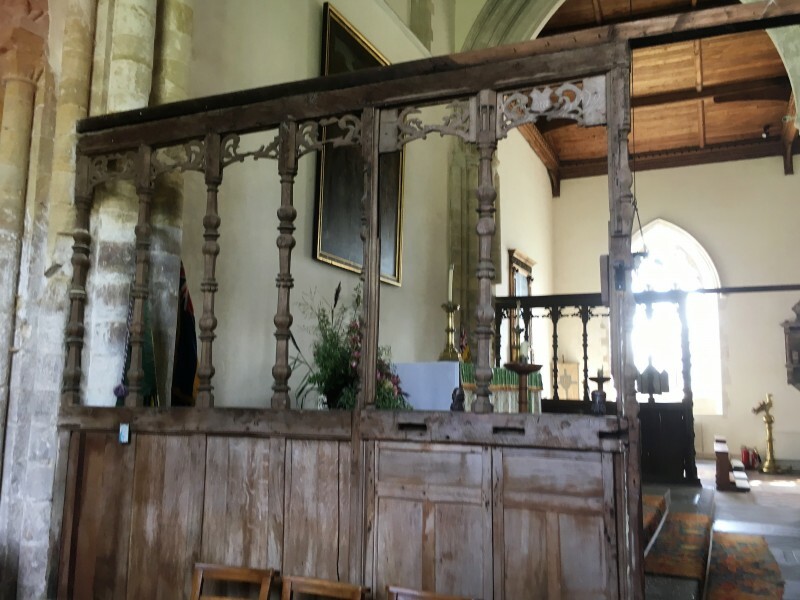 Next is a photograph of the screen from the chancel side. 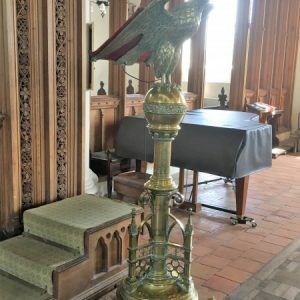 The screen was dedicated in 1921 in memory of Orford rector, the Rev. Edward Maude Scott d.1917. 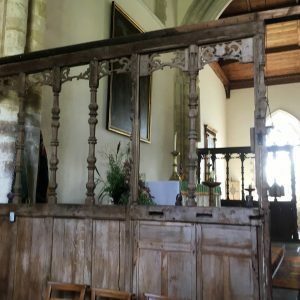 The third photograph shows the parclose screen between the chancel and north chapel, with the other parclose screen, dividing the south chapel from the chancel, in the background. They are possibly of 16th century origin. 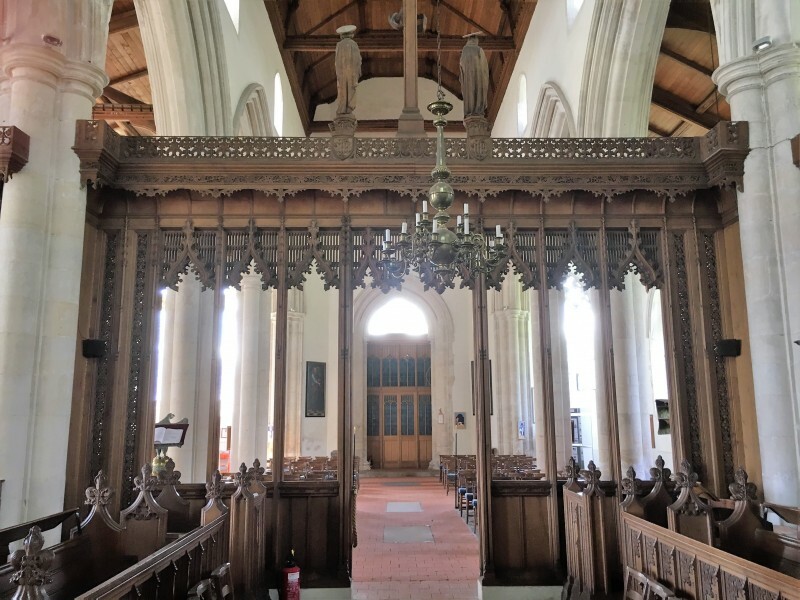 Next shown is a view from the nave across to the north parclose screen, with the arches between the north chapel and north transept in the background. These blocked arches are shown in more detail in the next photograph. 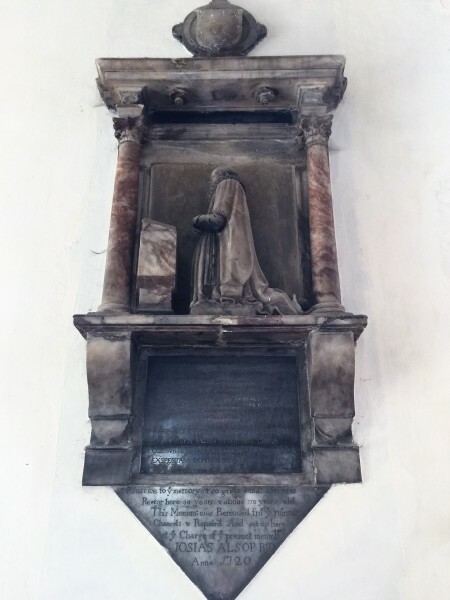 The sixth photograph in the gallery is of a wall monument in the St Nicholas/south chapel. 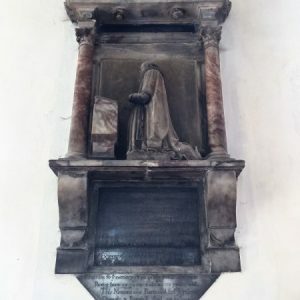 It is in memory of the Rev’d Francis Mason d.1621, and was moved to its current position in 1720 when the old chancel was disused and falling into ruin. 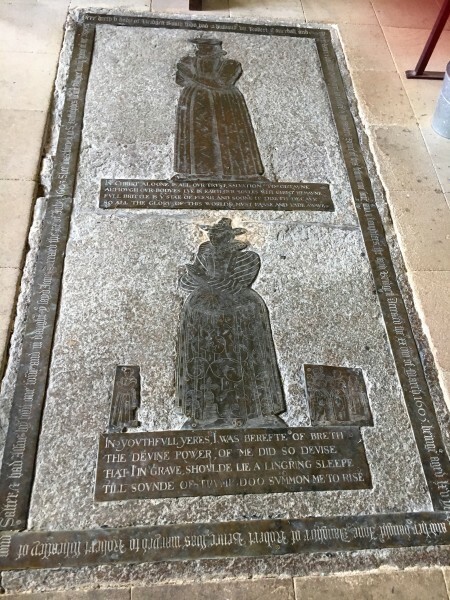 The next photograph is of a ledger slab in the floor of the south chapel. 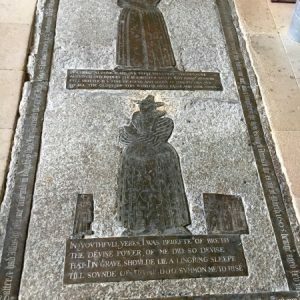 It carries two brasses commemorating Bridget Smith d.1605, and her daughter Jone Wheatley d.1603. 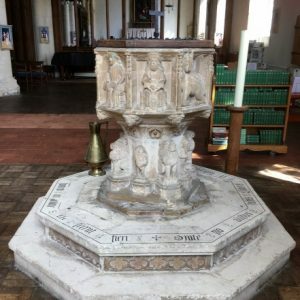 The early 15th century octagonal font is shown next. 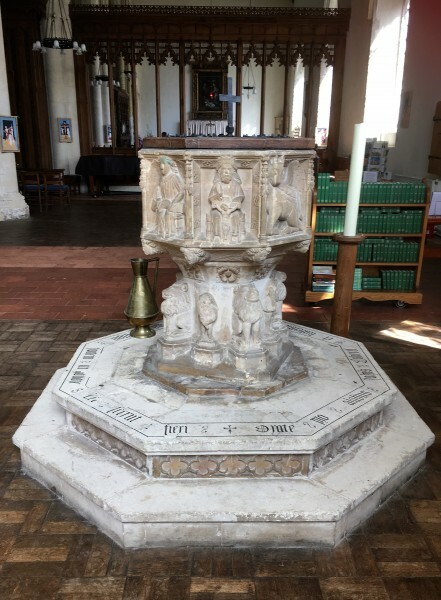 It is typical of Suffolk fonts with fine carvings of biblical figures in panels around the bowl, and lions and wodewoses (wild men) around the stem. 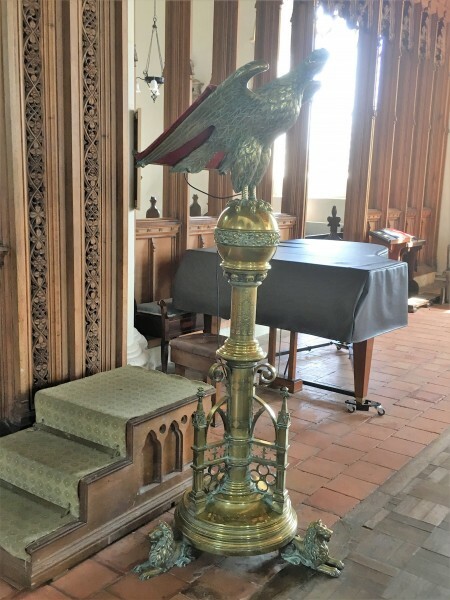 Finally is a photograph of the ornate brass lectern which dates from 1891.